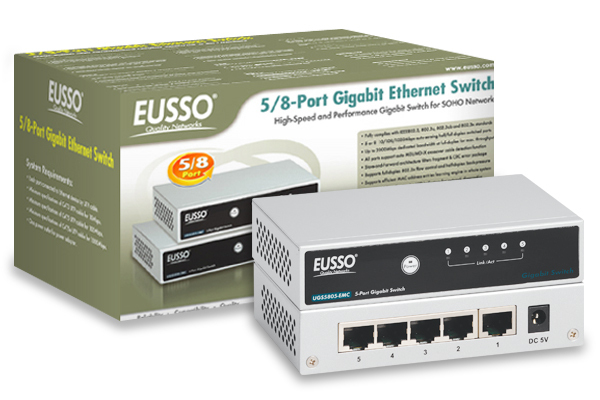 The UGS5805-EMC, 5-port 10/100/1000Mbps desktop Gigabit switch, provides an excellent solution for expanding your existing 10/100M network to 1000M Gigabit server backbone without any additional equipment. Moreover, it provides a backbone link to your switched workgroup or a server fat-pipe link. With such flexible architecture, user can easily plan the network without bandwidth and media limitation. With 10Gbps at full-duplex switch bandwidth, the switch is fully non-blocking architecture can support every switching port wire-speed performance. Compare to shared 10/100/1000Mbps networks, the switch delivers a dedicated 10/100/1000Mbps connection to every attached client with no bandwidth congestion issue. Store-and-forward switching mode promises the low latency plus eliminates all the network errors, including runt and CRC error packets. The Switch provides half and full-duplex capability on all ports to boost bandwidth for servers and power users and is fully compliant with all kinds of network protocols. Moreover, the rich diagnostic LEDs on the front-panel provide the operating status of individual port and whole system. It requires no configuration. UGS5805-EMC designs with an external power feature. It is compact in size, making it ideal for desktop with limited space. Drop this switch in place of your current workgroup hub and switch, and you can upgrade your current network to full Gigabit speeds as necessary.